The Great Nebula in Orion is visible to the naked eye as the fuzzy middle star of the sword. M42 and the connected M43 benefit greatly from mounted binoculars. Even in small binoculars, a wealth of detail becomes apparent, especially if you use averted vision. Give it time: the longer you look, the more you see of the nebulosity and the cluster of stars whose light it reflects. If you have larger binoculars of higher magnification, see if you can resolve the Trapezium (θ Orionis) into separate stars. 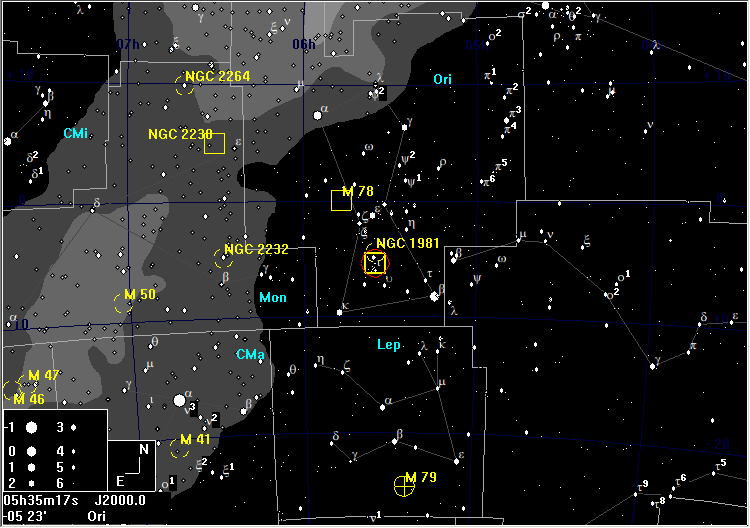 Binoculars will show that the other two "stars" of the sword into are also clusters. 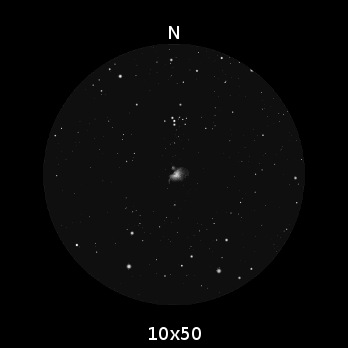 The northern one still has some reflection nebulosity (NGC 1973, 1975, & 1977) that may hint of its presence on dark, transparent nights, but the older southern cluster (NGC 1980) has none at all. These two clusters, which are older than that associated with the star-birth region of the Great Nebula, indicate the fate of the Great Nebula itself. The Great Nebula is a fine object for 50mm binoculars, but double the aperture and triple or quadruple the magnification, and it is almost like looking at a different object, especially on a transparent dark night. In big binoculars, far more fine detail becomes visible; it seems that the longer you look, the more you see, and a false stereopsis emerges. Look for structure around the "fish-mouth" and in the "wings". 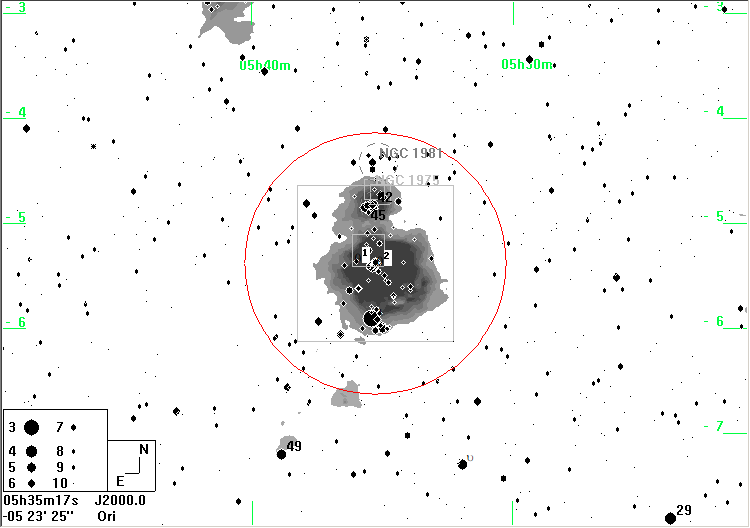 With a big binocular, good optics, and steady seeing the Trapezium (θOri) can be resolved into 4 stars. This showpiece of the northern winter skies is one to be enjoyed over and over again.